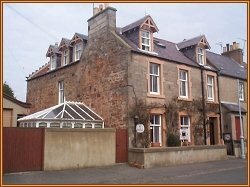 Set in the beautiful old fishing village of Crail, Selcraig is a traditionally built sandstone home dating back to the 1700s. The ornate cornices, carved staircases and period fireplaces remain to evoke the original character. Lovingly restored with attention to detail, it captures the peace and elegance of a bygone age but with 21st. century comforts and facilities including Wifi! The village itself has a wealth of historic buildings, some fine little shops, a pottery and a museum which helps bring the past to life. The ancient harbour is one of the most photographed in Scotland. Many pleasant hours can be spent exploring the wynds and soaking up the truly unique atmosphere of Crail. Then there are the fine beaches and sporting facilities. Golfers especially will be delighted with the two golf courses at Crail, the old and famous Balcomie Links and the newer but testing Craighead. Along the coast you will find small quaint villages, each with its own character and St Andrews, the home of golf, is only a short drive away. Here the old and the new sit comfortably side by side to appeal to a wide variety of tastes. The restored Byre Theatre, traditional shops, museums, castle and ruined cathedral are only some of the attractions.